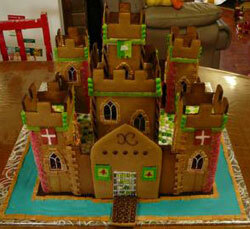 Would you buy this Gingerbread Castle Kit? If there's enough interest, we may be able to offer this castle kit within a few months. This gingerbread castle template is, by far, our biggest seller! So we'd LOVE to offer this castle design as not only a .pdf template, but also as a gingerbread kit! But, first, we need to know how much interest there is and whether you, our visitor, would be interested in buying one. Please take this brief poll to let us know what you think! 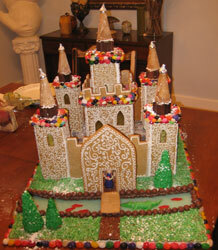 Would you buy this gingerbread castle kit? Imagine a kit with all of the tools necessary to build this gingerbread castle: gingerbread dough mix, cookie cutters, and royal icing. It's also possible that we could include all of the gingerbread cookies pre-baked, but that would cost more to ship (since the baked cookies weigh more than the mix). Please use the comments field below if you have a strong preference. Poll: Would You Buy This? If Yes, what price would you pay? Click here to see our gingerbread house patterns. Return Home from gingerbread castle kit page.